Leading indicators are those who lead the price movement. They give a signal before a new trend or reversal occurs. Lagging indicators are those who follow the price action. They give a signal after the trend or reversal has started. Let’s get started and first understand what is a Lagging indicator. Lagging indicators are typical “output” oriented. The importance of a lagging indicator is its ability to confirm that a pattern is occurring. It is also a technical/trending indicator that trails the price action of an underlying asset, and traders use it to generate transaction signals or confirm the strength of a given trend. Lagging indicators confirm long-term trends, but they do not predict them. Lagging indicators are generally drawn on price chart itself and they work great in trending markets. 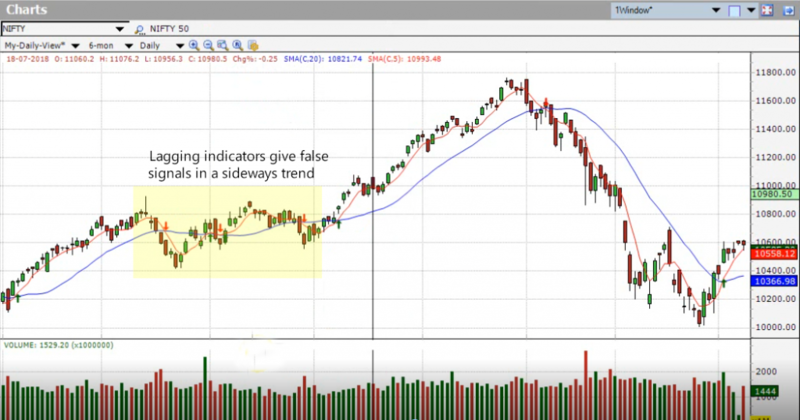 Examples of lagging indicators are Bollinger Bands, Moving Averages, Supertrend, etc. because they occur after a certain price move has already happened. Trending indicators like SMA are called lagging indicators because the Buy/Sell signals they generate generally lag the price action, meaning that a change in trend in price shows up in the indicator a little later. 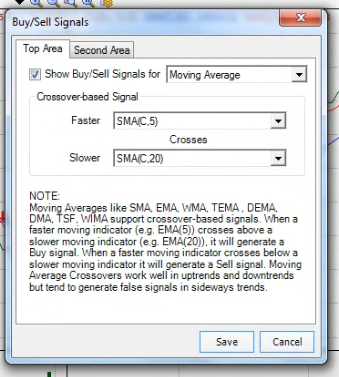 A Simple Moving Average (SMA), as the name suggests, is a moving average of the Closing Prices. As you can see in the chart below, when Nifty changed to a downward direction, it was captured by the 5-20 SMA Crossover a little later (as indicated by the sell signal), hence it is called lagging. Not all these signals are correct, however, and Lagging Indicators like SMA give false signals in a sideways trend while they behave perfectly well in an uptrend and downtrend (see the chart above). Note: Smaller parameters track the stock price more closely compared to the larger ones. Check out our video on “Lagging Indicators – Types of Indicators Part 1 (Watch in Hindi/Watch in English)” for an in-depth look into this topic. This entry was posted in Technical Indicators and tagged Lagging Indicator, Technical Analysis. Bookmark the permalink. The thumb rule in any sort of ‘spread trade’ is to buy the cheaper asset and sell the expensive one. Thanks for sharing a great article.